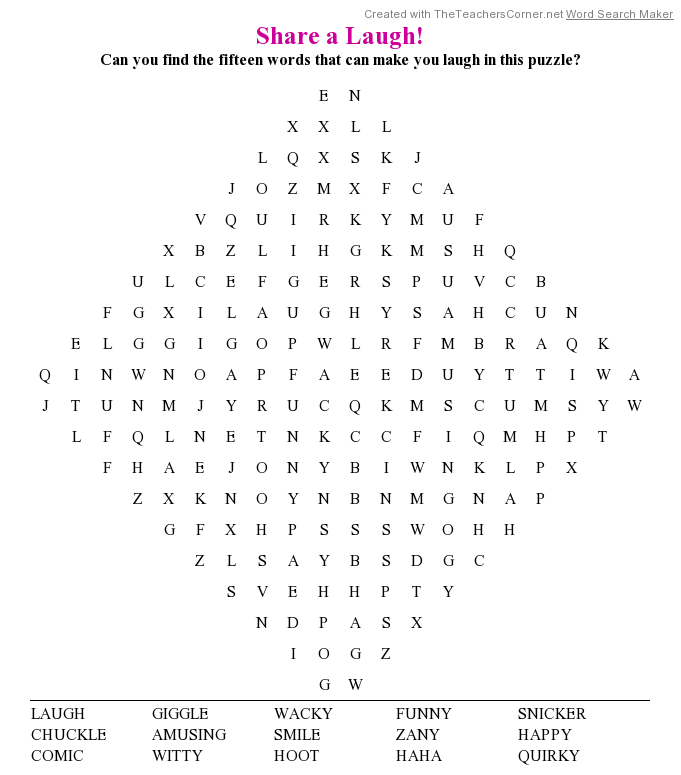 There may be no more infectious sound than the tinkle or guffaw of a good laugh. Laughter is therapeutic and can make tough times a little easier. Kids, it seems, are born with the ability to see and appreciate the silliness, absurdity, and fun in life. This month, enjoy the zany side of things—it’s guaranteed to brighten your days and give you a new perspective. Copyright Corinna Luyken, 2017, courtesy of Dial Books for Young Readers. Maybe…the perspective might just be right for…Yes! “the glasses—they were a good idea.” Okay on to the body. Hmmm… “The elbows and the extra-long neck? Mistakes. But the collar—ruffled, with patterns of lace and stripes—that was a good idea.” And elbow patches make the arms look a little less pointy. Moving on to the background, a thick and leafy bush is just the thing to hide the animal. Animals? It could be a cat, a cow, or a frog. “Another mistake.” And why is the ground so far below the girl’s feet anyway? Oh! Because she’s wearing roller skates. Nice save! “Those were definitely not a mistake.” Let’s see, the “second frog-cat-cow thing made a very nice rock.” Now, what about the other girl with long hair and one very long leg? Got it! She “looks like she always meant to be climbing that tree” on the side of the page. The ink smudges at the top of the paper can be leaves, but back to the roller-skating girl. What to do with those awkwardly positioned arms? Oh dear—the pen should not have been hovering over the page. How to fix the splotch on the side of her head? Ah-hah! An old-fashioned aviator’s helmet. Or is it a swimming cap? No matter…she’s now holding a yellow balloon in her left hand and lots of strings in her right. Wow, tons of yellow balloons are at the ends of those strings! She’s skating toward the tree with the long-legged girl, and there are a bunch of other kids playing in it too. Cool! They’re all wearing aviator helmets/swimming caps too. Some are wearing roller skates—good—and they’re erecting some kind of tent over a big branch. Wow! Look at the pink balloons and the green ones! There’s a kid riding a hot-air unicycle through the sky and a skateboarder is floating down to a ramp supported by springs in the top of the tree. Someone’s even tatting a lace banner. Kids will be charmed by the start of the little head on the first page, begin giggling at the one too-big eye on the third page, and laugh out loud at the even bigger eye on the fifth in Corinna Luyken’s magically inventive The Book of Mistakes. As each mistake is adjusted for or inspires a new twist in the story, young readers will appreciate how creatively right the fix is and look forward to the next mistake and the next. The final pages presenting the tree full of children are so enticing that readers will want to linger over each one to find all the details. Luyken’s minimally colored drawings are funny and endearing and lead readers to question their own perspective and give free reign to their imagination. The Book of Mistakes is a must for classrooms and highly recommended for home libraries for all those times when mistakes can be perfect conversation starters or the inspiration for…anything! To find a portfolio of artwork and more information about Corinna Luyken and her books visit her website. Sharing a laugh with friends makes a day better. 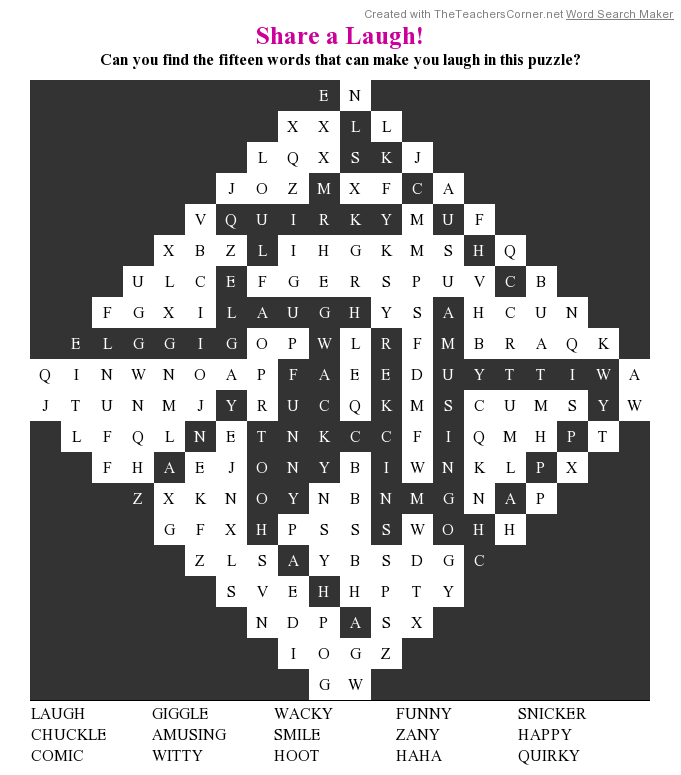 Can you find the fifteen words about laughter in this puzzle? Do you value craft store coupons more than the ones from the grocery store? When you look at math formulas, do you see brand new applications? Can you make a gourmet meal out of three leftover ingredients? If you think outside the box then you have a bright future! Whether you work in a traditionally creative field or not, the ability to think differently is a valuable asset. This month explore your creative side and share your ideas! A can with a lid can make a creative kit if you fill it with magnetic pieces that can be used to make scenes, faces, or even poems. Make the magnets yourself and you can create a kit that is uniquely yours! Make a kit to put in the car too! Today we celebrate the oyster—that mysterious ocean mollusk that many find delicious and that can hide a most precious gem. While some of you may honor the day with a plateful of fried or raw oysters, I’m choosing to highlight the bit of grit—that little mistake—that when it becomes embedded into the animal, creates a pearl of surprising value and uniqueness. Finding a pearl in an oyster is a lucky thing! Here are two oysters brimming with shiny pearls. 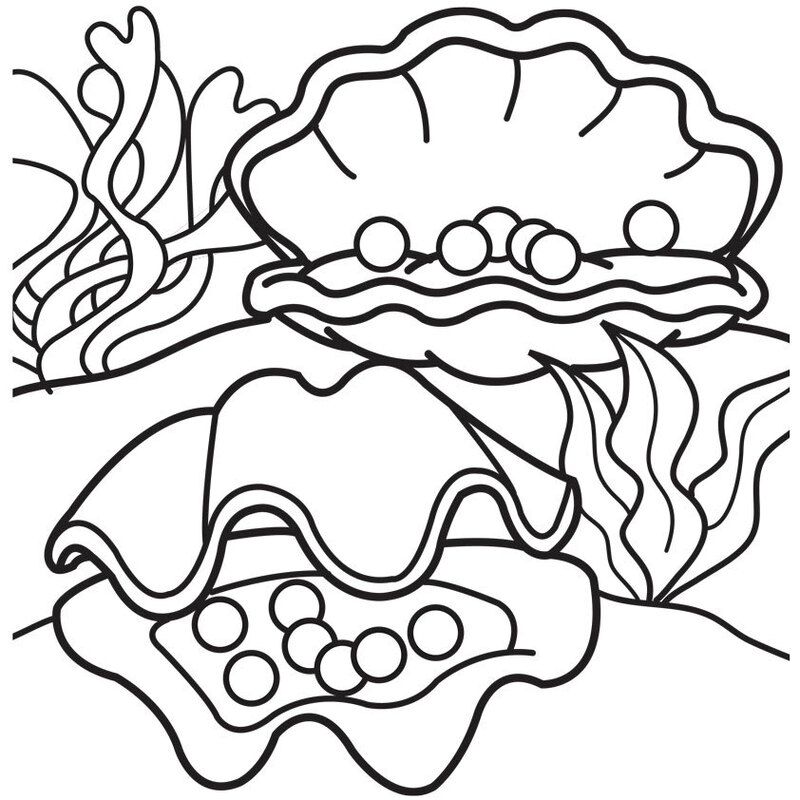 Grab your crayons, markers, or pencils—maybe even some glitter—and have fun with this printable Secret Pearls Coloring Page!